Precision medicine is the great healthcare promise of today and the future. Successful individual treatments regimens and research programs, at large academic medical centers and community hospitals alike, are already underway and saving lives. And with large-scale initiatives such as the National Institutes of Health's All of Us research program, which kicked off earlier this month, that bold vision will only grow in its potential to improve the health of patients and populations. Right? Well, yes, but. It's complex. Without policies in place, there are major mistakes that hospitals, researchers, clinicians and policymakers must avoid to get this right. 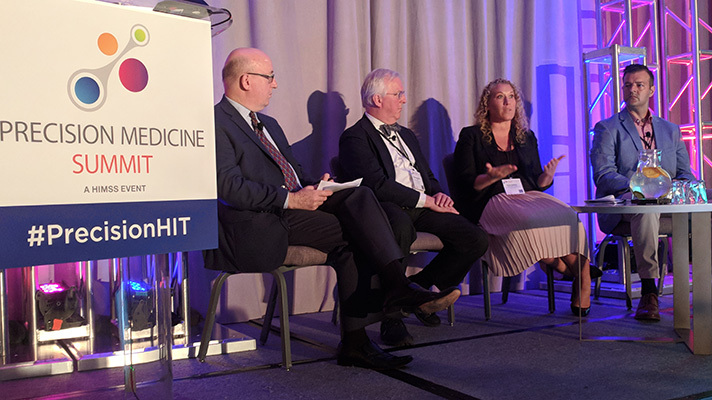 That point stuck with me among all the optimism here at the HIMSS Precision Medicine Summit in the nation's capital late last week. "Precision medicine is here," said Michael Dulin, MD, director of the Academy for Population Health Innovation at the University of North Carolina Charlotte. "We're living it." Even Dulin, a physician-patient who himself has benefitted from precision medicine, cautioned that there are enormous mistakes to avoid. Right now the technologies, including artificial intelligence and machine learning, are outpacing policy – and that puts a whole new degree of accountability squarely on the shoulders of hospitals, IT vendors, developers and others. "There is an increased responsibility for designers, developers, specialists to build the technology in a good, reflective way," said Paul Ford, director of the Center for Bioethics at the Cleveland Clinic Foundation. "It's our responsibility to try and protect against challenges because policy isn't there to guide us." That starts with talking to patients to find out what's most important to them because it might not be what designers think it is. A person with Parkinson's, for instance, could simply want to be able to eat soup in public above all else. "We need to create consumer experiences that are fun and engaging to make you participate in your own care," said Aviva Debeer, Global Solutions Executive at IBM Watson Health. "That begins with design." "There's a cost, not only financial but also to the health of the person, in acting on false positives and false negatives," said Sujay Kakarmath, MD a post-doctoral research fellow at Partners Connected Health and Harvard Medical School. "AI is not the same in other diagnostic systems because they learn in time. The black box gives you a prediction but doesn't tell how it came to the conclusion." "Patient activation is an important consideration in chronic disease, " said Richard Milani, MD, Chief Clinical Transformation Officer at Ochsner Health System. "Does changing behavior change outcomes? The answer is you can." Hospital "connectivity amongst each other is important but what's more important is our connectivity with patients," Milani said. "We need connectivity with our patients." "We have to bring the full environment to the patient," said Derek Cothran, senior vice president of client strategy and development at EnvoyHealth. "We have to address affordability and social aspects. We're patiently waiting on 5G to enable that." Which gives everyone – hospital executives, entrepreneurs and designers, CIOs and IT pros, as well as patients – the opportunity to start ironing out ethical issues associated with precision medicine. At least until the policy catches up.